New tests in the lab at Niger Delta University show that papaya leaf “tea” protects your red blood cells (erythrocytes) from free-radical damage (lipid peroxidation) better than ascorbic acid (manufactured vitamin C). Reduction of hydrogen peroxide-induced erythrocyte damage by Carica papaya leaf extract. Asian Pac J Trop Biomed. 2012 Jun;2(6):449-53. doi: 10.1016/S2221-1691(12)60074-4. Biochemistry Programme, Department of Chemical Sciences, Niger Delta University, PMB 71, Wilberforce Island, Bayelsa State, Nigeria. OBJECTIVE: To investigate the in vitro antioxidant potential of Carica papaya (C. papaya) leaf extract and its effect on hydrogen peroxide-induced erythrocyte damage assessed by haemolysis and lipid peroxidation. METHODS: Hydroxyl radical scavenging activities, hydrogen ion scavenging activity, metal chelating activity, and the ferrous ion reducing ability were assessed as antioxidant indices. In the other experiment, human erythrocytes were treated with hydrogen peroxide to induce erythrocyte damage. The extract (at various concentrations) was subsequently incubated with the erythrocytes and later analysed for haemolysis and lipid peroxidation as indices for erythrocyte damage. RESULTS: Preliminary investigation of the extract showed that the leaf possessed significant antioxidant and free radical scavenging abilities using in vitro models in a concentration dependent manner (P<0.05). The extract also reduced hydrogen peroxide induced erythrocyte haemolysis and lipid peroxidation significantly when compared with ascorbic acid (P<0.05). The IC50 values were 7.33 mg/mL and 1.58 mg/mL for inhibition of haemolysis and lipid peroxidation, respectively. In all cases, ascorbic acid (the reference antioxidant) possessed higher activity than the extract. CONCLUSIONS: The findings show that C. papaya leaves possess significant bioactive potential which is attributed to the phytochemicals which act in synergy. Thus, the leaves can be exploited for pharmaceutical and nutritional purposes. Dr Dang’s research on the effect of papaya leaf “tea” on cancer reviewed the now proven impact of T-1 type cytokines on communicating an immune response. The article below explains how cytokines “talk tea”. Background: Three networks of intercellular communication can be associated with cytokine secretion; one limited to cells of the immune system (immune cells), one limited to parenchymal cells of organs and tissues (body cells), and one involving interactions between immune and body cells (immune-body interface). These cytokine connections determine the inflammatory response to injury and subsequent healing as well as the biologic consequences of the adaptive immune response to antigens. We informatically probed the cytokine database to uncover the underlying network architecture of the three networks. Results: We now report that the three cytokine networks are among the densest of complex networks yet studied, and each features a characteristic profile of specific three-cell motifs. Some legitimate cytokine connections are shunned (anti-motifs). Certain immune cells can be paired by their input-output positions in a cytokine architecture tree of five tiers: macrophages (MΦ) and B cells (BC) comprise the first tier; the second tier is formed by T helper 1 (Th1) and T helper 2 (Th2) cells; the third tier includes dendritic cells (DC), mast cells (MAST), Natural Killer T cells (NK-T) and others; the fourth tier is formed by neutrophils (NEUT) and Natural Killer cells (NK); and the Cytotoxic T cell (CTL) stand alone as a fifth tier. The three-cell cytokine motif architecture of immune system cells places the immune system in a super-family that includes social networks and the World Wide Web. Body cells are less clearly stratified, although cells involved in wound healing and angiogenesis are most highly interconnected with immune cells. Scientists have discovered that papaya leaf tea stimulates macrophages, the “big eaters” in your body. Macrophages clean up waste in your body including poisons, pathogens, and, of course, cancer cells. 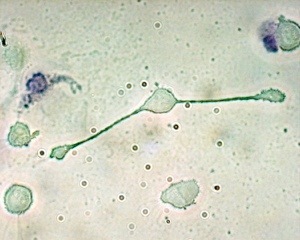 In photo above the macrophage is extending its arms to engulf two pathogens. American Physiological Society (2010, August 27). Aug. 27, 2010 — The term “macrophage” conjures images of a hungry white blood cell gobbling invading bacteria. However, macrophages do much more than that: Not only do they act as antimicrobial warriors, they also play critical roles in immune regulation and wound-healing. They can respond to a variety of cellular signals and change their physiology in response to local cues. Immune-regulating macrophages produce high levels of the cytokine interleukin-10, which helps suppress the body’s immune response. Suppressing an immune response may seem counter-intuitive, but in the later stages of immunity it comes in handy because it limits inflammation. According to Dr. Mosser, immune-regulating macrophages may hold the key to developing treatments for autoimmune diseases such as multiple sclerosis or rheumatoid arthritis. The focus of new research is on reprogramming the macrophages to assume a regulatory phenotype and prevent autoimmunity, he said. Dr Nam Dang is a medical oncologist with expertise in the study and treatment of lymphoma and chronic lymphocytic leukemia (CLL). He is Professor and Deputy Chief of the Division of Hematology & Oncology and also is Director of the University of Florida Shands Cancer Center Clinical Trials Office. 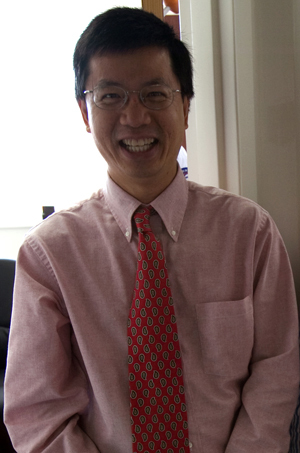 Dr. Dang received his Phd in Immunology from Harvard. A clinical study in 2001 was performed on 2,339 breast cancer patients. The study was meant to determine the effect of oral enzymes (OE). Papaya Leaf Tea is a form of (OE) Oral Enzyme Therapy, with the most powerful food enzyme available. A clear reduction in the side effects of radiotherapy and chemotherapy was documented in 74% of the test group and 55% of the control group. Analysis of survival, recurrence, and metastasis demonstrated a reduced number of events in the test group. There was evidence of a beneficial influence of OE on time to event, although the median observation time was too short in these breast cancer patients to draw definite conclusions. The safety component was judged in 98% of the test group and 76% of the control group as “very good” or “good”. In the total sample of 2,339 patients, the rate of OE-associated adverse reactions was 3.2%. All side effects were mild to moderate gastrointestinal symptoms. We hope the supporters of Susan G Komen can read this study. Six years ago I felt a need to get the support of an oncologist in my research about clinical trials related to papaya leaf tea, papain, and related ethnomedicine. I looked up credentials of oncologists in various cities around where I lived in Savannah, GA. I decided to call Dr. Daniel Nixon who was at the time working in Charleston, SC. I said the first time that I heard his “Hello”, “Hi, I am Virginia Robertson. I want to talk with you about papain and papaya leaf tea and its effect on cancer. I want you to read my research.” Dr Nixon said, “Who are you?” I said, “Virginia Robertson”. I didn’t have credentials. But the kind doctor sent me his email and I forwarded my research. Two weeks later he called me back and said that he thought I may have something. Dr Nixon arranged for us to do some research with an associate of his in a lab that studied melanoma at Clemson. I sent samples. This positive result was one of the markers for me that helped me continue my pursuit. I want to thank Dr. Nixon for his help early on. 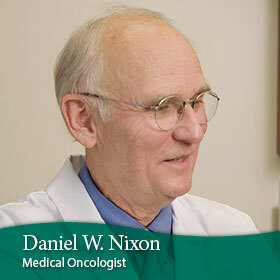 Currently Dr. Nixon works for Cancer Treatment Centers of America in the Western Region Medical Center near Phoenix. Dr. Nixon is a member of the Senior Executive Service for the United States of America, Nutrition Oncology Research Cooperative Agreement, American Federation for Clinical Research, American Medical Association, American Society of Clinical Oncology and American Association for Cancer Research.